There’s just one month left of the year! How will you make the most of it? 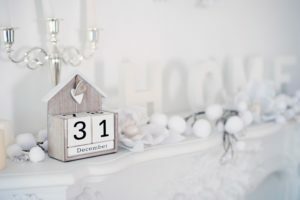 Don’t wait until Jan. 1st to set New Year’s Resolutions (that you’ll inevitably break by Jan. 8th…) Start now – where you are and with what you have – to get more of what you want (and less of what you don’t) in the year ahead! Time’s nearly up! How will you end this year with success and resolve? They Self-Assess – Successful people don’t wait for a supervisor or performance review to tell them how they’re faring. They reflect with regularity and honesty about their accomplishments and fine-tune their goals and processes as necessary. Take a moment during the busy holiday season to celebrate successes, acknowledge shortcomings and adjust accordingly. What’s worked for you this year and what changes do you need to make for the next chapter? They Don’t Allow Fear to Get in the Way – Successful people know that failure is part of the game. They don’t let uncertainty hold them back and when they get knocked over they don’t stay down long. They start with a single step and keep putting one foot in front of the other until they reach their destination. When have you been held back by fear and how can you battle through it? They Reign in Their Narrator – If you’ve got an inner critical voice that’s not helping you, it’s time to have it re-cast. Guess who’s in charge of this story? YOU! Stop beating yourself up over past mistakes, second-guessing your present choices or approaching the future with anxiety. Successful people spur themselves on with positive and realistic self-talk. What’s an old or unhelpful narrative you need to debunk and dismiss? They Grow Their Cast of Supporting Characters – Every hero(ine) needs a sidekick to help her through the toughest times. Sometimes we need an army. Our Cast of Supporting Characters can change over time so recruit support regularly. Get yourself a Cheerleader (who believes in you no matter what), a Collaborator (who spurs your best ideas), a Realist (who holds you accountable) and a Coach or Mentor (who has walked your path and has advice to share). And don’t forget about the rewards of serving as a Supporting Character in someone else’s story! Who are your biggest supporters and how can you best help others reach their goals? They Don’t Wait for the Perfect Moment – How often do you say you’ll get started “as soon as” things calm down on the home front or you lose 5 lbs. or you finish your current project? There’s always something in the way. Successful people don’t play the waiting game or require circumstances to be perfect before they launch. They get their projects and goals off the ground and make adjustments as they go. What can you do to get started in small ways now? They Do More of What Brings Them Joy – If you’re always in a hyper-productive State of Crazy, you’ve likely trimmed things from your life deemed unnecessary. But if you’ve trimmed too much – those things that bring you joy or satisfaction – you’re likely to be burned out and bitter from missing out. Identify and schedule more of what makes you happy (coffee with a friend, a hike with your dog, quality dark chocolate). Adding moments of joy will make you more satisfied, focused and accomplished in the months ahead. What small things can you add to your own happiness? They Clear out Clutter – Clutter is a creativity killer. It’s why I rid my house of 30,000 items, shedding things no longer of value and allowing me to focus on what’s most important. And clutter isn’t just tangible things. Employ edit mode to trim from your story anything that’s weighing you down like self-defeating thoughts, unrealistic expectations or frenemies. How might you add to your life by what you take away? They’re Mindful of Their Personal Brand – End of year is a great time to review your professional and social media accounts to make sure your on-line presence is messaging the story you most want to tell. Review connections, update your information and clean up your timeline. And during this festive holiday season, consider what you post and how it might be received. How are you maximizing social media for professional success and personal goal-setting? They Communicate Their Needs – Stop assuming people know what you want and learn to ask for it! Conversations are always open to interpretation so make sure you’re being heard. Focus on the “Four C’s” of Communication: Be Clear, Concise, Convincing and Conversational. While you’re at it, learn how to toot your own horn without feeling braggy. When in the past have you struggled to speak up for yourself and what do you most want to say? They Prioritize Their Well-Being – You can’t operate at peak performance without investing in yourself. If you’ve let good habits slide, pick them up again, one at a time. Put devices on bedtime mode for uninterrupted sleep, fill your plate with colorful foods (not Skittles), get some fresh air on a walk and pick up some heavy weights at the gym. Even the super-busy can find time for self-care. Good habits beget more good habits. Where have you slipped into unhelpful habits and where do you need improvement? They Know When to Change it Up or Walk Away – Insanity is doing the same thing over and over again and expecting a different result. Successful people know you can’t necessarily change a situation, but you can change your approach or your attitude towards it. And if all of your best efforts have failed, it’s OK to walk away from something that isn’t working for you. There are benefits to being a quitter and moving on to a better place. What do you need to change or leave behind in the year ahead? They Don’t Sweat the Small Stuff – Successful people have their eye on the big picture and know where not to waste their energy. I had to learn not to give a sh-t about the person who unsubscribed from my newsletter because they were offended by my article titled “Things I No Longer Give a Sh*t About (And You Shouldn’t Either)”. Keep your eye on the prize and let the little things go. Ask yourself if what’s bothering you will matter in five years and where else you might expend your energy? You don’t need to wait for the New Year to start a New You. Use these final weeks of 2018 to turn the page and start a new storyline. Take these 12 tips to Take Command. Your future self and your next chapter is waiting for you. Valerie Gordon is the founder of career and communications strategy firm Commander-in-She, LLC. Her innovative conference breakouts and professional workshops help women with the skills and tools necessary to harness the power of their story and ascend the leadership ladder… on their own terms.